Disclosure: I am being hosted at this event, but all thoughts and opinions are my own. Being a foodie, I want to spend Mother’s Day with my family doing something foodie-themed of course! 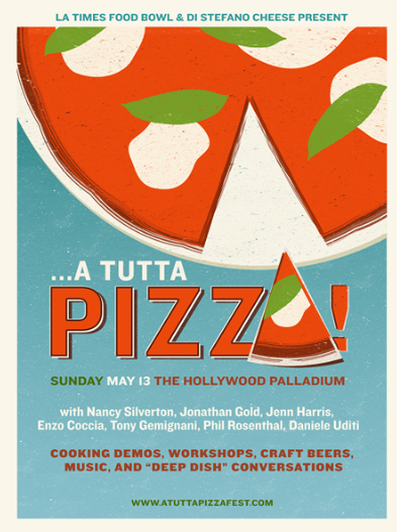 I thought the perfect thing to do with my family would be to head to The Hollywood Palladium on Mother’s Day for A Tutta Pizza Fest! The L.A. Times Food Bowl (happening until May 31, 2018) is having an annual community event on May 13th to celebrate healthy eating and urban agriculture. This years event…A Tutta Pizza Fest! At A Tutta Pizza Fest, pizza makers from around the world will gather together for cooking workshops, cooking demos, and cooking demos. In addition, at the Mother’s Day event you can ind 20 food vendors, photo booths, and even a DJ spinning music! Appearances of many special guests including top pizza chefs Enzo Coccia, Nancy Silverton, Zach Pollack, Tony Gemignani, Daniele Uditi, L.A. Times restaurant critic Jonathan Gold and Times Deputy Food Editor Jenn Harris, and producer and host Phil Rosenthal (Somebody Feed Phil, Netflix). The cooking workshops are part of The Authentic Italian Table Series, which is curated by the Italy-America Chamber of Commerce West. The series highlights the art of Neopolitan pizza, and the values of Italian food culture. With Italian food being one of my favorite cuisines, I can’t wait to learn more about the culture and tastes behind pizza and authentic Italian cooking! 5:00 PM Workshop Session – Flour and egg: The magic of Pasta! Hope to see you there! To learn more about A Tutta Pizza Fest, visit the official page here.